Can. Ch. Hi-Cliff's Montana Woodside OFA. "What a hunk! His name truly fits him: he is "Free and easy" in motion but more over, he moves with power and authority. This beautiful dog is all male with a gorgeous outline, headpiece, neck and ear set. He has an iron back. 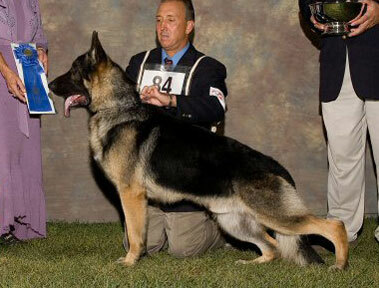 In the Winners class, he pushed the Open Dog very heard and made the decision difficult. An exceptional animal whose career I will watch with joy as it is bound to be a spectacular one." "Another extreme and aggressive mover. A bit darker than #1 with a beautiful outline standing and in motion. Also not hard to find. Clean down and back, solid back with a bit higher wither than the GV with a bit less in forehand."